You know what drives me kinda crazy? When people say call-E-flower, instead of call-i-flower. Yep, I'm picky like that. Fortunately, I'm not as picky when it comes to the preparation of my vegetables. In fact, I'm a firm believer that simplicity is the best policy regarding certain veggies (especially broccoli, which I love steamed and unadulterated, and cauliflower, which I prefer roasted). The thing is, when you have food this close to perfection, why mess with it? In honor of not "messing with it," here's my favorite way to eat cauliflower. It's simple, fairly quick, and oh-so-delicious. 1.) Preheat oven to 400 degrees F, & line a rimmed baking sheet with parchment paper. 2.) Cut cauliflower into florets, rinse well in a colander, & pat dry. 3.) Pour cauliflower into a large bowl, drizzle with olive oil, salt, & pepper, & stir gently to coat. 4.) Spread florets onto parchment-lined baking sheet, keeping separated. Bake for approx 25 mins. total, tossing with tongs after 15 mins. Serve immediately or enjoy leftovers directly out of the fridge! 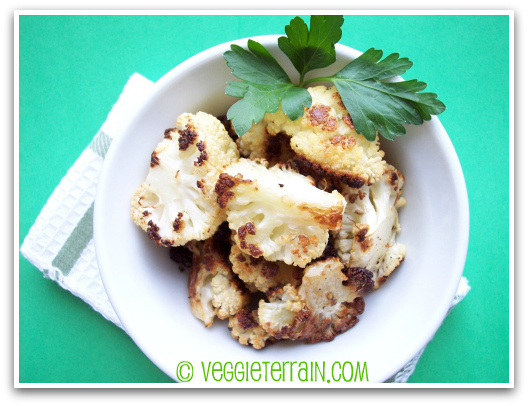 I love roasted veggies and this cauliflower looks delish! Your cauliflower is browned to perfection. I can't think of a better way to cook veggies than roasting. This is my favorite way to eat cauliflower! Always delicious. 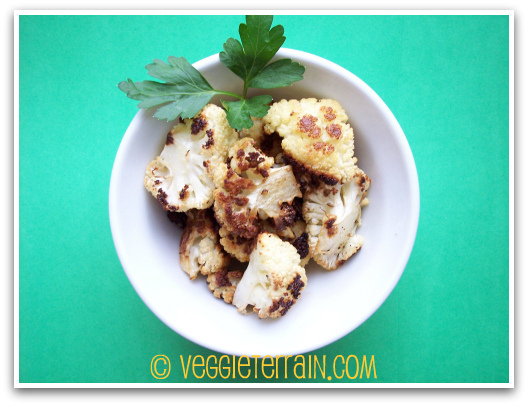 I love love love roasted cauliflower!! I like putting some nooch on mine.